Yoga rings – also known as the ‘magic circle’ in Pilates – are designed to provide more resistance during poses and help maintain correct form throughout. The added pressure can also increase the effectiveness of poses and stretches, yielding greater results and helping to take your workouts to the next level. Women’s Health and Fitness Online stocks a number of designs, with those for beginners, through to more advanced options. Available in four colours, these designs are tailored to add support to your workouts. When you use a yoga ring, similarly to a wheel, you’ll find it provides support as well as resistance, enabling you to perform advanced stretches and poses, and get more from your workouts. 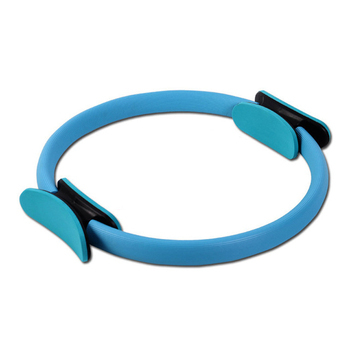 These accessories are also extremely versatile and can also be used for a range of exercises. Use these accessories to tone your arms and chest, work out your legs and back, as well as to improve your overall form. The multi-faceted approach of this tool has made it a popular piece of equipment in classes around the globe, and their compact size makes them for complete portability. When you buy from Women’s Health and Fitness Online, you can rest assured that we’ve carefully selected everything in our range based on quality and reliability. As wellbeing and fitness enthusiasts ourselves, we know what to look for when selecting innovative products, and we’re proud to use our passion and expertise to help others on their journey. Whether you’re just starting out or want to kick things up a notch with a yoga ring, we’ve got you covered. Once you’ve made your decision to buy a yoga ring online, your order will be shipped to your doorstep. We endeavour to source the most affordable rates for our customers, with free delivery for orders of $100 or more. Discover more about our shipping rates here. We consider ourselves a hub for all things health and wellbeing, with articles and blogs exploring different facets and personal journeys, as well as nutrition and workout plans. Browse our site to discover more about what we have to offer or get in touch by emailing info@womenshealthandfitness.com.au.